An artist’s impression of the Jewel of the Creek. Habtoor Leighton Specon (HLS) and Drake and Scull Engineering (DSE) have joined hands to deliver the Dh395-million ($107 million) mechanical, electrical and plumbing (MEP) contract on the Jewel of the Creek complex in Dubai, UAE. The deal is for Package Eight, which forms a significant part of the $1.09-billion Jewel of the Creek mixed-use development being developed by Dubai International Real Estate (Dire). 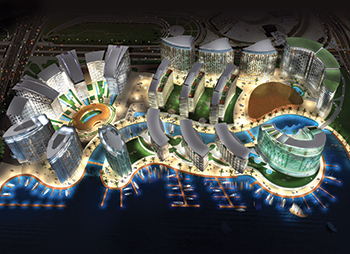 Package Eight of the development consists of five hospitality buildings ranging between 15 and 19 floors, featuring a hotel and serviced apartments buildings, a ballroom and an attached café; a marina, including four footbridges and one vehicular bridge; and hard and soft landscaping works. Construction work on the package has commenced and completion is targeted for Q2, 2017. HLS was nominated by Dire as the MEP contractor of the prestigious project and has agreed with DSE to execute the works in a joint venture, combining the vigour and expertise of the two companies to deliver the project to the high standards of the client. The project is designed by Kling Consult and Kieferle and Partner joint venture (KCKP JV), which presented the winning entry in an international competition. The masterplan embraces the location, reflecting the waves and steady movement of the creek. The development aims to transform the location into a vibrant urban centre and a prominent landmark in the heart of Dubai. “The vision is to create a project of strong identification, a complex as a unit unparalleled along the creek with functions linked to each other, yet each part of the development with its own expression and values. The project will set a benchmark for future developments and it will be one of the much sought-after addresses in Dubai,” says a spokesman for HLS. He says the new award signifies the trust shown to HLS by prominent clients over the years for the delivery of high-end hospitality projects. “It complements our excellent portfolio of landmark developments and takes our work-in-hand to over $1 billion, solidifying our position as one of the leading MEP players in the region,” Thrasyvoulou adds. The HLS-DSE JV will work under the main contractor of the project, the Habtoor Leighton Group (HLG), to deliver the MEP works of the package which consist of fit-out works in basements, complete MEP works for buildings including state-of-the-art systems associated with the latest technologies for smart and sustainable construction, and associated external works. DSI picked up Dh5.34 billion ($1.45 billion) worth of new projects in 2014 and its projects backlog stands at an all-time high of Dh14.4 billion ($3.92 billion), according to Al Naser. “We are committed to playing a key role in the ongoing preparations for World Expo 2020 through our involvement in several iconic additions to Dubai’s landmarks. “On a broader scale, the UAE represents one of our bigger markets and so we anticipate further growth in our backlog here. Our integrated engineering solutions will definitely have an impact on the directions of UAE infrastructure and property development, as will be proven by our ongoing work on major projects such as the Mall of the Emirates expansion, Habtoor City, Louvre museum, Maliha Hospital, Danat Al Emarat Hospital, and the Plaza View development. Moving forward, we intend to contribute to the UAE’s rail development agenda as well by combining DSE’s technological superiority, talented workforce and global footprint with Drake and Scull Rail’s proven record in delivering turnkey rail construction and maintenance solutions,” says Al Naser. HLS, a partnership between Habtoor Leighton Group and Specon of Australia, is a market leader in the design, engineering, procurement and construction of MEP, energy and power projects. DSE, a subsidiary of Drake and Scull International, is a regional market leader in the integrated design, engineering and construction disciplines of general contracting, MEP, water and power, rail, and oil and gas, and water and wastewater treatment.